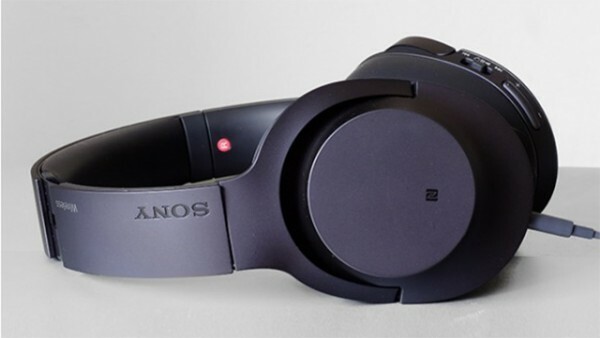 The Sony MDR-100ABN h.ear on Wireless headphones are made for the buyer who wants everything. They have the eye-catching looks of a set of street headphones, and also include wireless functionality and active noise cancellation. This is the holy trinity for folk wanting headphones for use while out and about. However, as is always the case with such tech-heavy headphones, it is possible to get better sound quality from a simpler alternative. Nevertheless, the Sony MDR-100ABN h.ear on Wireless is the full package, with a sensible price to boot. They cost £219, which is identical to the non-wireless, non-ANC Sennheiser Momentum 2.0. Nice work, Sony. The Sony MDR-100ABN h.ear on Wireless may sound like on-ear headphones from the name alone, but they&apos;re actually full-sized units. The ear pads sit around your ears, not on them. While this means they’re fairly large, in terms of comfort they&apos;re ideal. I’ve worn the Sony MDR-100ABN h.ear on Wireless for five hours at a time without any issues. 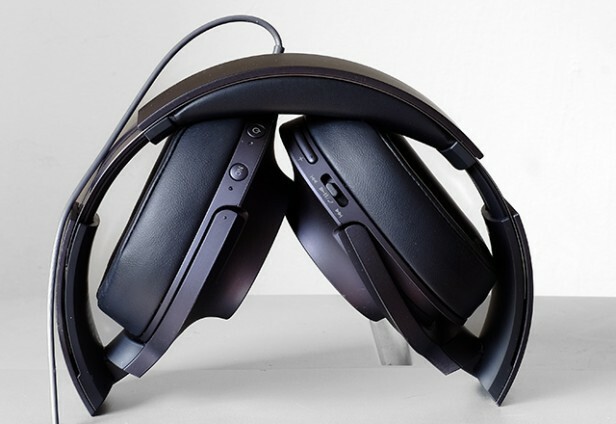 Featuring large synthetic leather pads and curvy metal cups, the Sony MDR-100ABN h.ear on Wireless are the wireless, ANC version of the MDR-100AAPL, which cost around £150. They&apos;re a little less fancy than the Sennheiser Momentum 2.0 On-ear, for example, which have real leather pads and some nicer finishing touches. But until you view the MDR-100ABNs up close, however, you&apos;d assume build quality was on a par. I’ve heard only the tiniest bit of plastic creaking in the Sony MDR-100ABN h.ear on Wireless. On the whole, these headphones are well made. Their extra features are totally worthwhile, too. I’ve been using the headphones with the Samsung Galaxy S7, and wireless performance has been flawless. There&apos;s been no signal break-up, no weird digital squawks to ruin your enjoyment. Being a Sony wireless set, the MDR-100ABNs also benefit from LDAC support. This is a proprietary standard that transmits audio at three times the data rate of your average pair of wireless headphones. LDAC is only really of interest to owners of higher-end Sony MP3 players and Sony Xperia phones, but the MDR-100ABNs also include aptX and NFC. aptX offers quality somewhere between normal Bluetooth (which uses the SBC codec) and LDAC, and works with many more devices. NFC is used to quickly pair headphones to mobile devices, with numerous smartphones featuring the technology. iPhones have NFC functionality, but it can’t be used with headphones such as this. It&apos;s an Android/Windows benefit. So in terms of wireless performance, it’s a perfect score for the Sony MDR-100ABNs. I’ve had the opportunity to use the headphones on both trains and the London Underground (no planes, sadly), where I can make use of the active noise cancellation feature. Its effects are less aggressive than those of the Bose Quietcomfort QC25. 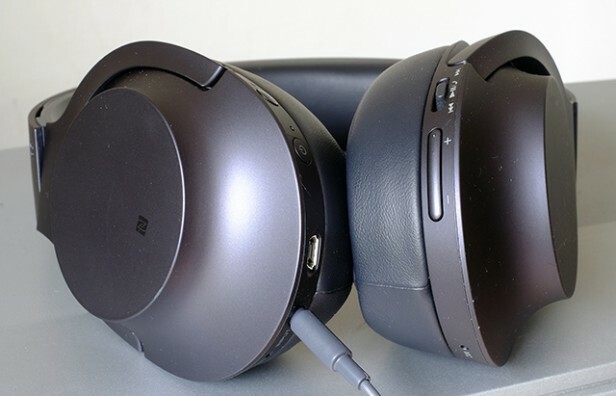 Less mid-range and high-register noise is eradicated, so if you use the Sony MDR-100ABN h.ear on Wireless headphones in an office rather than on a train carriage, the result is a little less eerily quiet. However, on the plus side there&apos;s no obvious sound pressure sensation in your ears, which some people find quite uncomfortable. The Sony headphones share many of the positive features of the Bose headphones too. Wiping out low-register noise means you don’t have to increase music volume in noisy environments, and the auditory stress of noisy crowds and tube trains just evaporates. I almost missed my stop a few times because the roar of entering the station just wasn&apos;t present. While I’d still recommend the Bose QC25 over these for the most effective noise reduction, the Sony headphones are 95% there. The one negative is that the MDR-100ABN noise cancellation mode becomes a little noisy on blustery days. Microphones sit at the bottom of each cup, and wind seems to whip around their holes, causing wind-like noise. Battery life is rated at up to 20 hours, and the Sony MDR-100ABN h.ear on Wireless have an built-in battery that&apos;s charged using a familiar micro-USB port. Should you run out of battery, you can use a cable too. There’s one in the box; it plugs into a 3.5mm jack on the left cup. When using wireless, you can control the volume and music playback via controls on the right cup. Since this uses standard Bluetooth commands, it will work with just about any current smartphone. 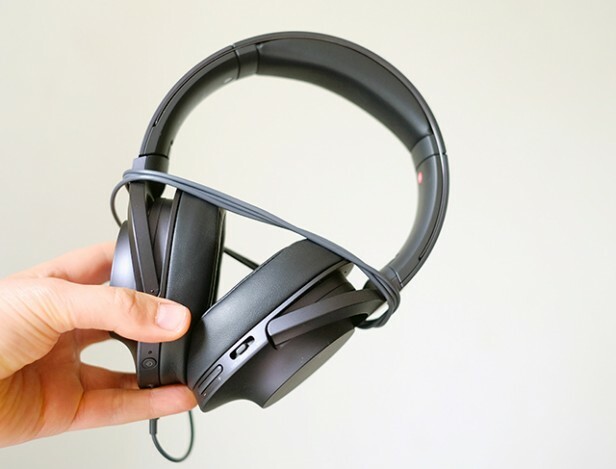 While the Sony MDR-100ABN headphones appear to be identical to the MDR-100AARP aside from wireless and ANC, the sound quality is quite different. These headphones sound quite poor without any power running through them. The treble is veiled, and there’s a serious lack of punch and definition. You’ll want to use these headphones without power only in emergencies. However, you can switch them on without using wireless or noise cancellation. The sound tightens up hugely when the power flows. They become very enjoyable headphones, with an easy-going sound that’s full, clear and quite fun. In addition, there isn&apos;t a huge difference in sound quality as ANC is switched on and off, which is a real boon. Listening to them side-by-side with the Sennheiser Momentum 2.0, you can appreciate that these are £150 headphones upscaled with a boatload of extra tech. While the tonal balance is comparable – offering a little extra bass, but not too much – the Sennheiser headphones display greater bass dynamics and a more nuanced mid-range. They may be Hi-Res headphones, but they’re not "hi-fi"-like in the way that some headphones around the £200 mark are. Nevertheless, the Sony MDR-100ABN h.ear on Wireless are still an excellent package that offers sound I’ve been happy to listen to all day for the past few weeks. Note that when powered, they don’t offer the soft bass I’ve heard in some of Sony’s older £100-150 headphones. SHOULD YOU BUY THE SONY MDR-100ABN H.EAR ON WIRELESS? The Sony MDR-100ABN h.ear on Wireless are some of the best city-dweller headphones you can get for around £200. Bose’s QC25 offer slightly better ANC and the Sennheiser Momentum 2.0 have better sound quality, but the mix of great wireless, great active noise cancellation and enjoyable sound is a convincing combo in the Sony MDR-100ABNs. You’ll pay £150 more for the direct rival from Sennheiser, the Sennheiser Momentum 2.0 Wireless; right now, there&apos;s no wireless version of the Bose QC25. 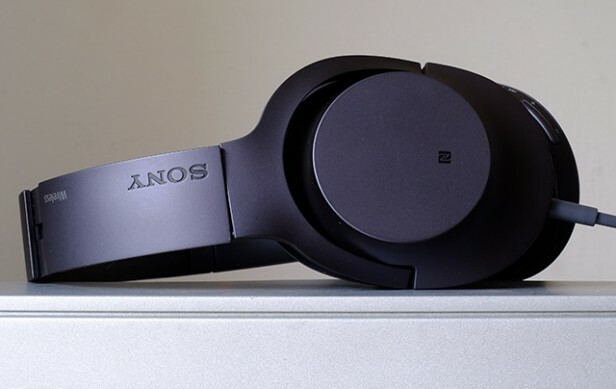 Decent sound quality, great wireless, and noise cancellation that&apos;s comparable to that of the Bose QC25 make the Sony MDR-100ABN h.ear on Wireless and excellent option for just about anyone who lives or works in the city.